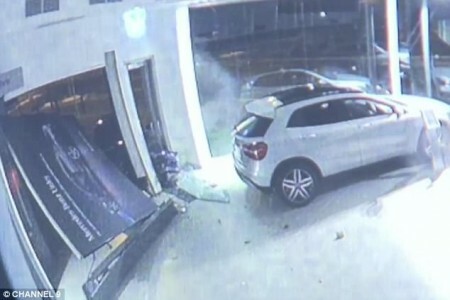 A driver lost control of his car and flew straight into a Mercedes-Benz dealership in Adelaide, Australia, causing huge damage. Luckily, he narrowly missed three cars parked on display worth over half a million dollars. 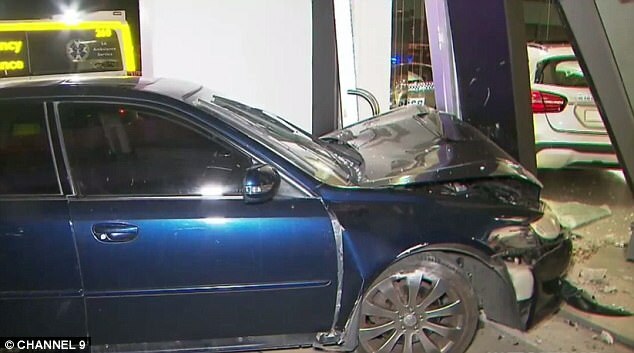 Huge noise put the whole neighborhood on their feet at 1:30 a.m. when a car slammed into a luxury cars dealership after veering across Unley Road in Adelaide. The horrific moment the driver failed to control the steering wheel was caught on the surveillance camera. The video recorded after midnight shows the blue sedan mounting the curb before smashing into a glass roller door. A local television channel reported that the driver at fault passed terribly close to the show cars worth over $500,000. “A foot either side would have been a significantly different story”, said the dealership manager Drew Ford, who arrived at the site before dawn and watched the emergency crews pulling the car out and removing the debris. “We are the ones that suffer financially, it is a big impact on our business, which is disappointing”, Ford told reporters. The CCTV video also shows the driver getting out of his car and stumbling away after the crash. He was admitted into hospital with non-life-threatening injuries. The police are investigation the crash and waiting for the result of driver’s blood tests before the determine the penalty. Mercedes-Benz 240 D – A lifetime on the road and never broke down once!